Worf was born in 2340 on the Klingon homeworld, Qo'noS, as the son of Mogh, patriarch of one of the Klingon Empire's Great Houses. When Worf was five years old, his father took him and his mother to live on the Khitomer colony. There, Mogh took Worf on a ritual hunt along with a garrison warrior, L'Kor. Worf had not yet reached the Age of Inclusion and was barely able to hold a bat'leth. During the hunt, Worf was mauled by a beast, leaving behind a scar and memory he kept throughout his life. At some point when Worf was a child he had a pet targ. In 2346, the Klingon Empire and the Romulan Star Empire were officially allied but a conspiracy between the Romulans and the House of Duras left the Klingon Empire open to betrayal. Romulan forces attacked the Khitomer colony, killing nearly all the 4,000 Klingon colonists including Worf's parents. The colony's distress call was answered by the Federation starship USS Intrepid. An Intrepid chief petty officer, Sergey Rozhenko, found Worf buried in the rubble. After the Klingon Empire stated that the young boy apparently had no living relatives, Sergey took Worf to his homestead on the farming colony of Gault. He and his wife, Helena, raised the Klingon child alongside their own son, Nikolai. The two boys thought of each other as siblings. As the sole Klingon in a small farm culture, Worf had some difficulty adapting to his new circumstances, though; years later, Helena described her son as bright and highly spirited as a boy. Soon after his arrival on Gault, the seven year-old bloodied the noses of five teenage boys, whom Worf deemed "disrespectful." In 2353, at thirteen years of age, Worf led his school's soccer team to the championships, where, in an attempt to score, he collided with another player, Mikel. The impact of Klingon ridges against a Human skull snapped Mikel's neck, and the boy died the next day. This lesson in Human frailties made a huge impact on Worf's nascent character. His self-control, interpreted by some as part of his Klingon heritage, was a large factor in his serious demeanor. The Rozhenko family eventually moved to Earth, where Sergey frequently took Nikolai and Worf camping in the Ural Mountains. At night, Worf often listened raptly to the sound of wolves howling in the distance. At fifteen years of age, Worf voyaged to Qo'noS, where he stayed with cousins of the House of Mogh in 2355. Here, he made the formal declaration of his intent to become a warrior and performed the Rite of Ascension. During the ceremony, Worf was presented with a well-forged knife, a gift from a Klingon who had known Mogh. Seeing the Great Domes of Qo'noS made him feel at home, but his kin rejected his marked Human taint. Worf fasted for three days before undertaking the Rite of MajQa. After six days of meditation in the volcanic Caves of No'Mat, the legendary Klingon warrior Kahless the Unforgettable appeared to Worf in a vision and prophesied that Worf would do something that no other Klingon had ever done before. Worf became the first Klingon to enter and graduate from Starfleet Academy. This achievement may be Kahless' prophecy fulfilled. Worf served as an ensign aboard the USS Aldrin from the years 2361 to 2364. Also on the Aldrin were "Dream Team" alumni Soleta and Tania Tobias. In 2363, Worf was a part of an away team on the planet Kalandra Minor that was attacked by Romulans. This was the first time Worf had encountered the race since his parents' deaths all those years ago, and he did not hesitate to use lethal force against those that he encountered. In 2364, Lieutenant junior grade Worf was assigned as a command division bridge officer and Assistant Security Chief on the USS Enterprise (NCC-1701-D), under the command of Captain Jean-Luc Picard. Worf spent most of his first year on the Enterprise-D as a relief officer for the conn and other bridge stations. Worf was permitted a variation from the Starfleet uniform dress code, and wore a Klingon warrior's sash, sometimes called a baldric by Humans, over his regular duty uniform. Worf's first major task was to take command of the Enterprise-D saucer module and lead it to safety, when the ship separated prior to engaging Q for the first time. The order ran contrary to his nature (i.e. fleeing while his commanding officer was in danger) and Worf briefly objected until Picard reminded him of his duty. Worf was transported to a different quantum reality and into the year 2379 along with the Enterprise-D and all it's personnel. 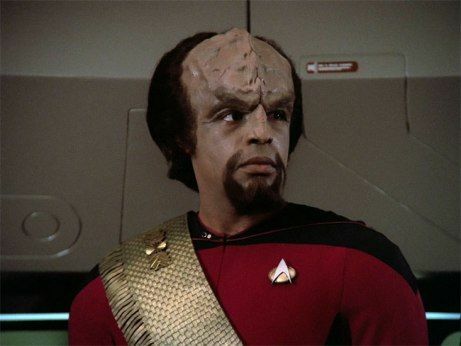 After arriving in 2379 Worf realized that the House of Mogh was disgraced in the Klingon Empire and his duplicate had become a member of the House of Martok. While Worf was offered a place in the House of Martok Worf was still unsettled by the events. As part of his command training Worf was put in temporary command of the USS Discovery until Commander Dax could arrive from the Alpha Quadrant. While on Discovery Worf sought the council of Voq, who appeared human in the body of Ash Tyler.